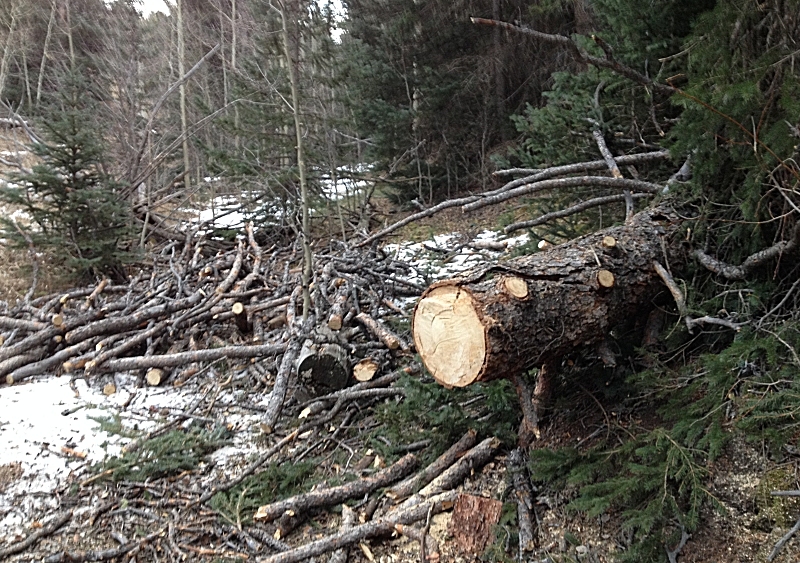 Visit the large, fallen tree to remove it. 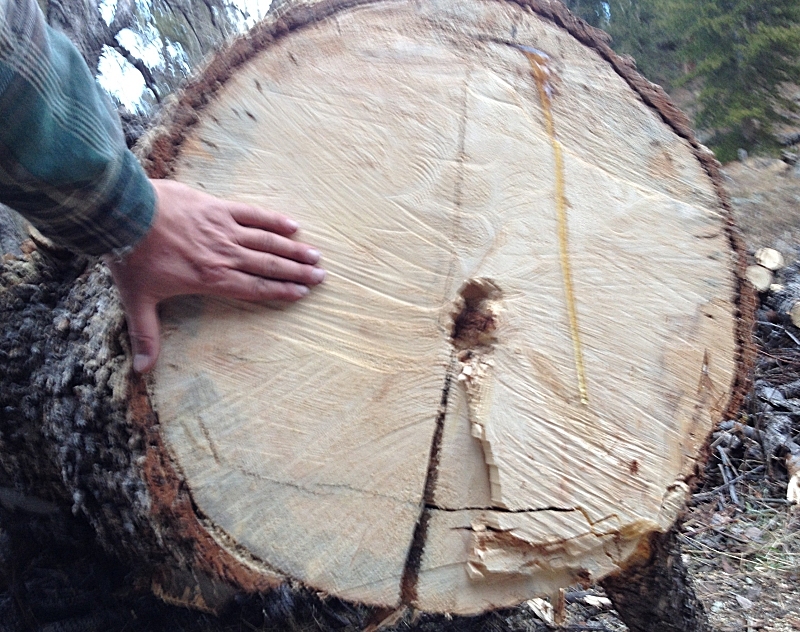 The last time I visited the Pole Hill trail (a week+ back) the group encountered a large tree across the trail. 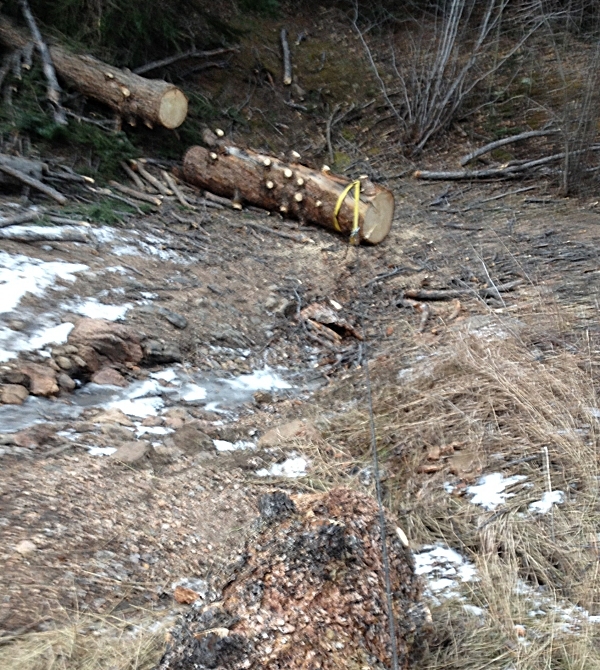 I am rather curious as to test the power inverter / electric chain saw combination on a longer project. Would it cause issue for the jeep's charging system? (I brought the battery from my car - just in case the jeep's battery went dead / had an issue and I needed to leave the area). Overall, it was a good, productive day. The system works well. I do have to pay attention to not overload the saw as it will trip the inverter, though it is not overly sensitive. I belive I reset the inverter about five times for all of the cuts that were made. 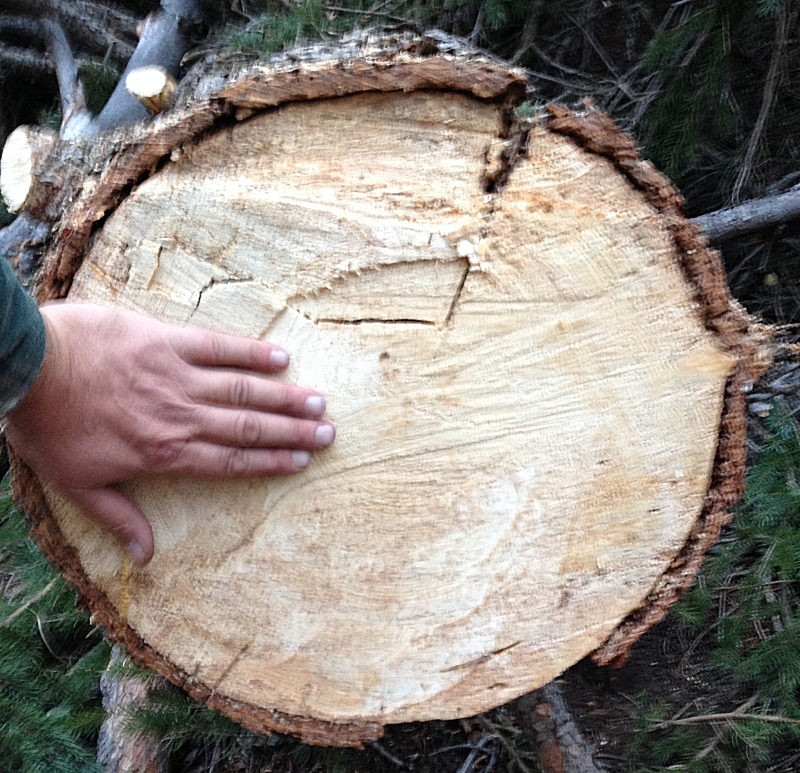 I pulled up to the pine tree at 1:30pm and up to the big tree at 2:00pm and finished the big tree at 4:30pm. Three hours for two trees - 1/2 hour for the first and 2-1/2 for the second. I filled the gas tank at Lyons CO on the way to Pole Hill and when I came back from Pole Hill. 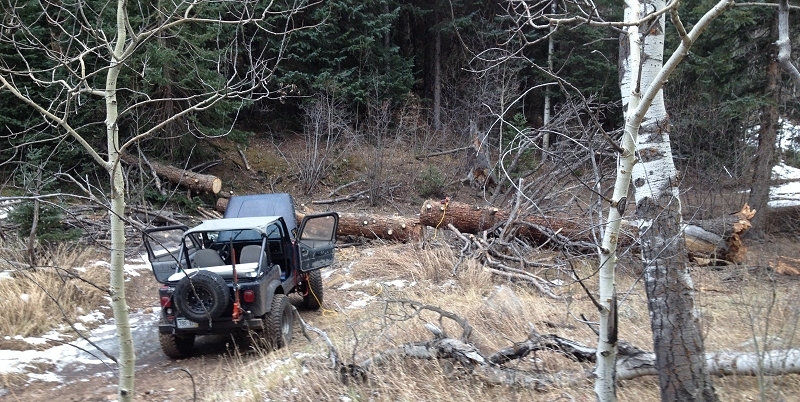 The Jeep gets about 15MPG highway and 9MPH trail. It's 18.8 miles gas station to trailhead. Trailhead to tree and back to the trailhead is 4.5 miles. I'll say 2.5 gallons for highway use and 1 gallon for trail use. The remainder was for engine idle while running the inverter. Wrap up - 3.5 gallons for travel and 1.776 gallons for high-idle of the motor for three hours (0.6 gallon per hour). An easy "gallon per hour" would be a safe rule of thumb to remember (though perhaps only 1/2 gal per hour for standard idle). I am curious as to how the voltage meter reacts to the longer duration power inverter use. 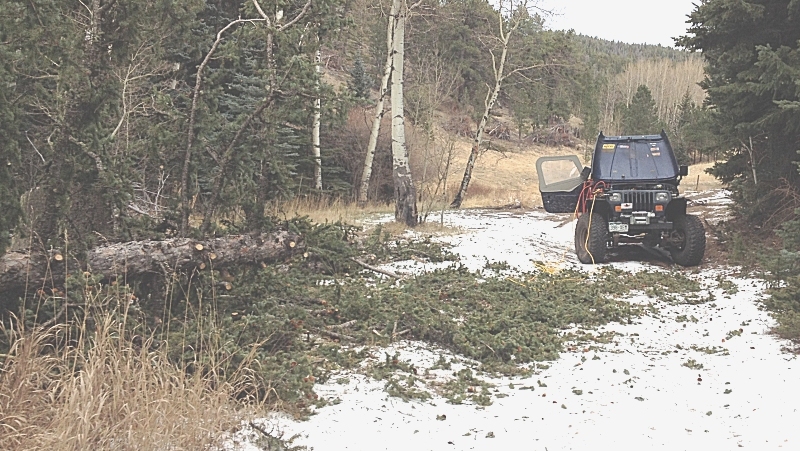 The chain saw is 120 vAC @ 9 Amps (1080 watts). The jeep's motor will be sitting for several hours at high-idle (~1100 to 1300 RPM). I'll be watching system voltage and fuel consumption in particular. 50 Feet west of the mud pit was this somewhat fresh pine tree. It wasn't here a few days ago. Aside from wind, I wonder what caused it to fall. 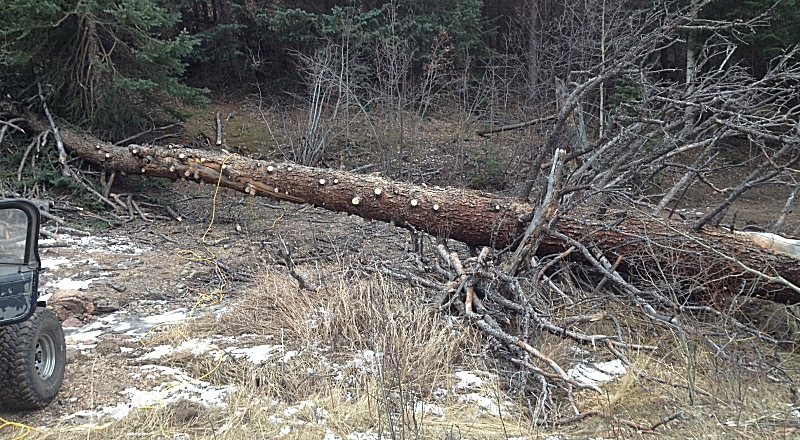 Today is not a windy day, thankfully, as I would be concerned for other deadfall trees. Arrived at the scene and started to prep. 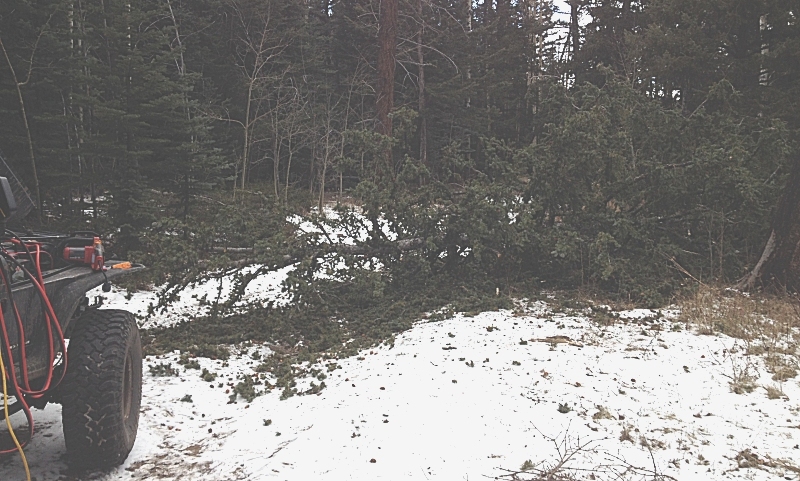 About an hour to clear the limbs from the trunk and trail area. 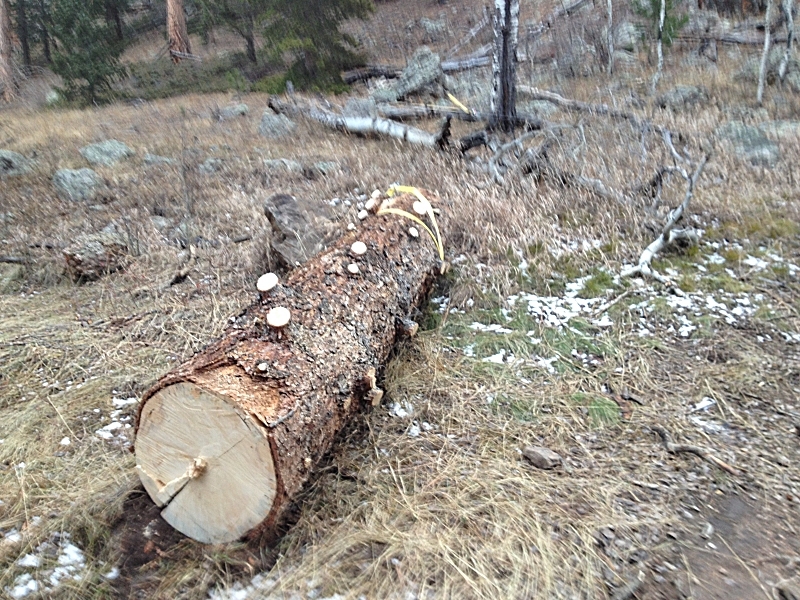 Now to decide how I wish to cut the trunk - for safety and ease. 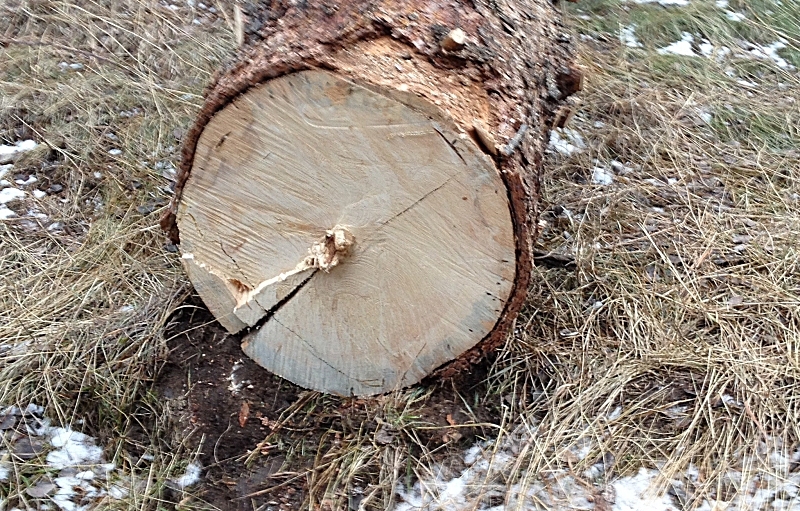 First trunk cut complete. 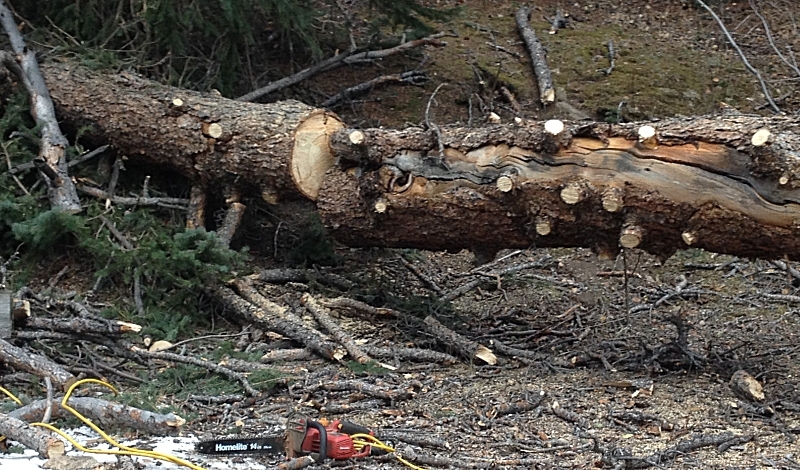 With the trunk "suspended" I needed to pay attention to how the tree would open / react to the first cut. Cutting the smaller diameter end first made for an easier cut (bottom up for the most of it). 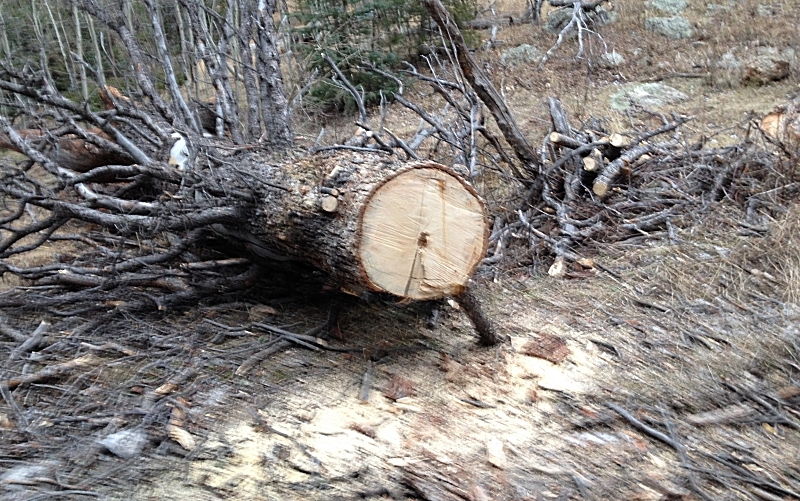 The other two cuts, with the trunk suspended with a free end, made for easy, predictable top-down cuts. Sitt'n on a rock making a post to the group that the tree cutting is complete. The three large cuts took an hour. I stopped to fill the bar oil a few times. Tightened the chain a few times. The original chain came off twice. For the final cut I put on a new chain. 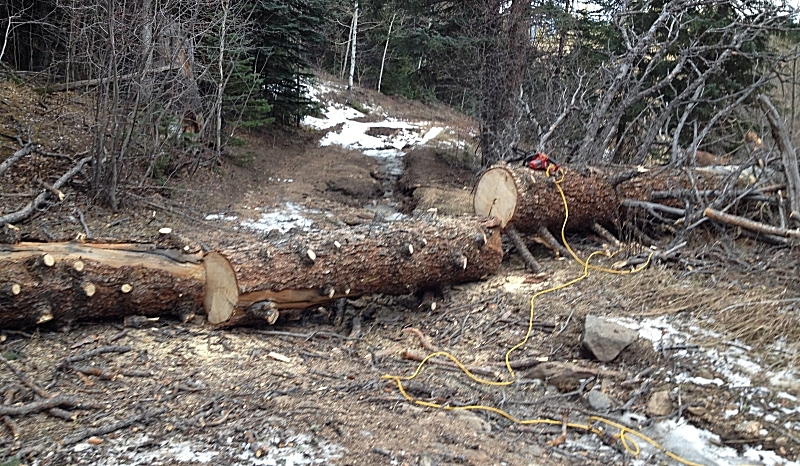 Three large cuts to produce two sections. 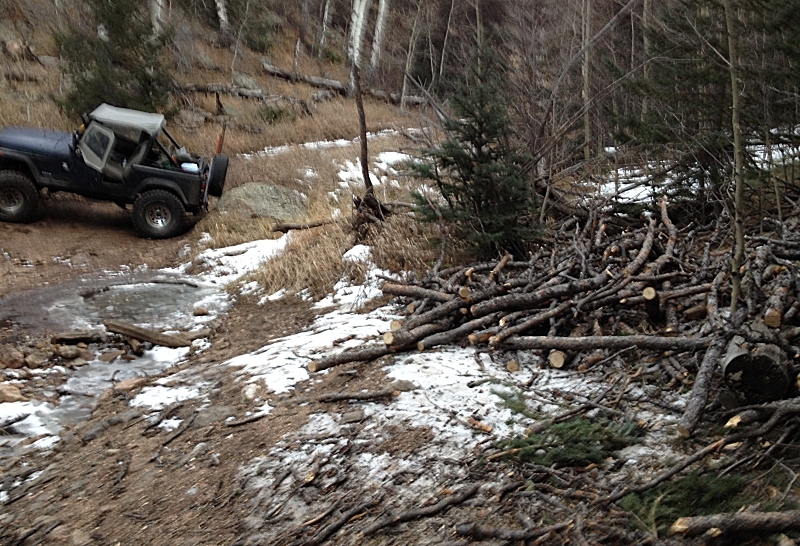 They should be manageable enough to haul off of the trail. If the video is not visible, your web browser most likely does not support HTML5 video. Update to a current browser might tend the issue. Pivot point. 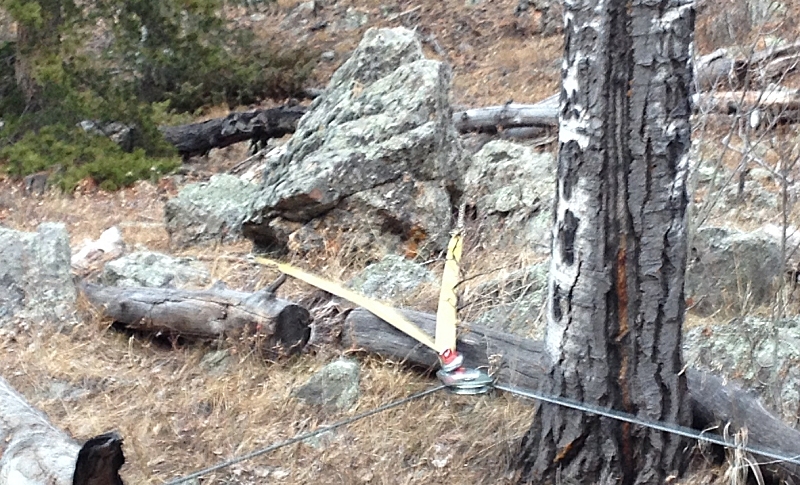 Chain around the base of the rock with a yellow strap for an extension to clear the tree. 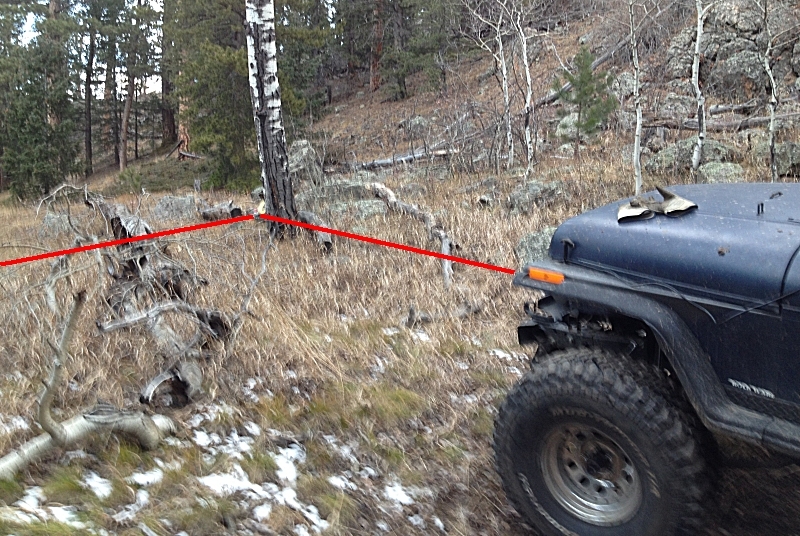 Second log to winch off of the trail and up the hill. 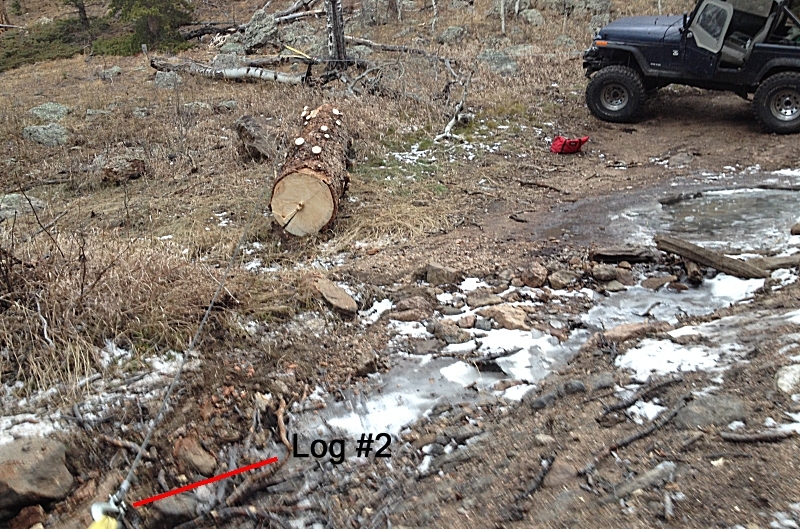 Where the two large logs sit. They do a decent job of blocking off a "bypass" that started to be made. 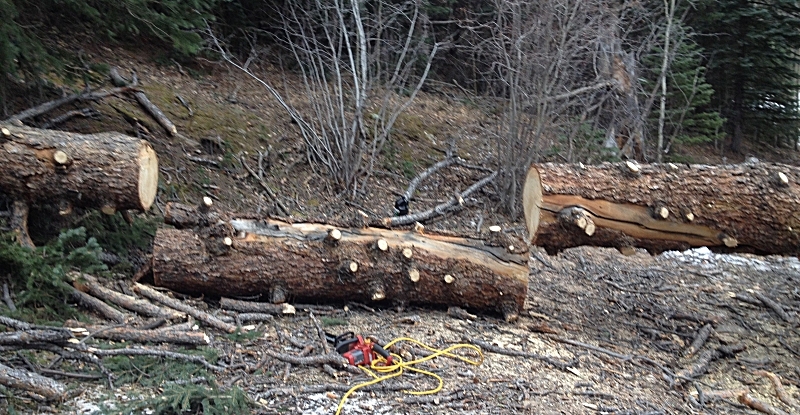 Most of the cut limbs. Trailside - the face for the peak of the tree. 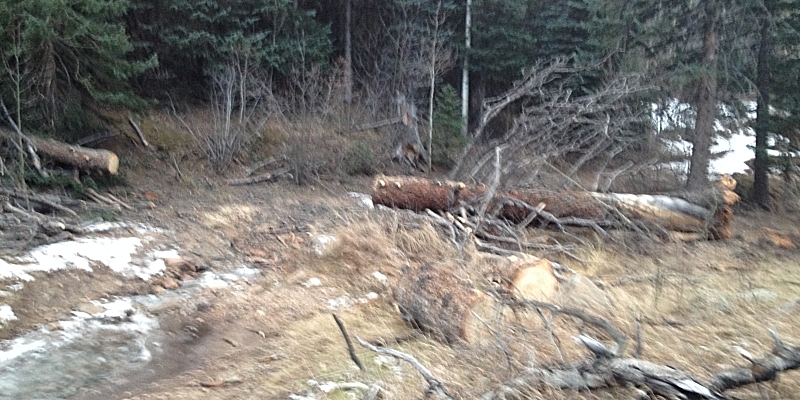 Trailside - the end towards the base of the tree. Putt'n out a tear for a life well lived. Packed (somewhat) to leave the worksite. 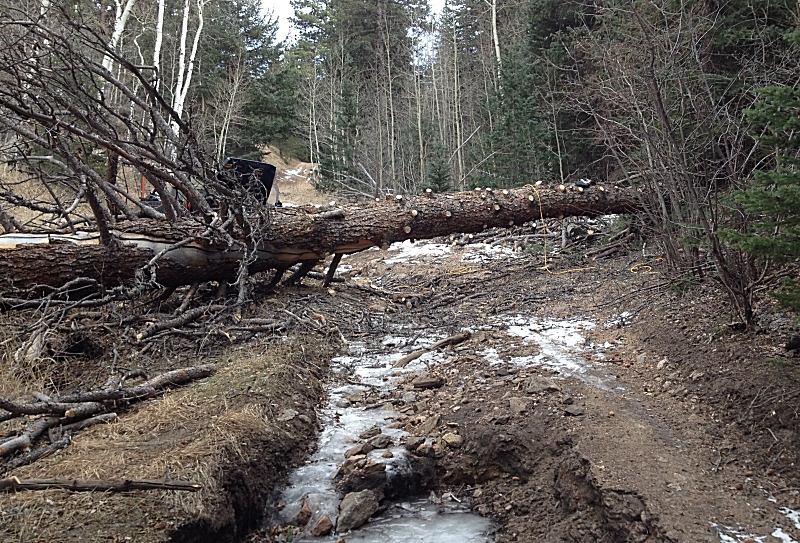 I recalled one fallen tree alongside the trail earlier back. 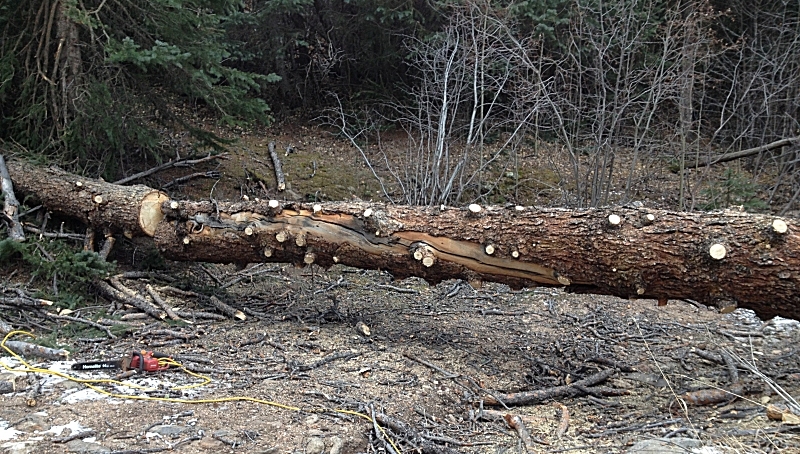 It was large enough the chainsaw was desired vs. hand saw. I left the cords and inverter ready for use when I arrived back there. I should have left it out as there was another, that I forgot, later down the trail. 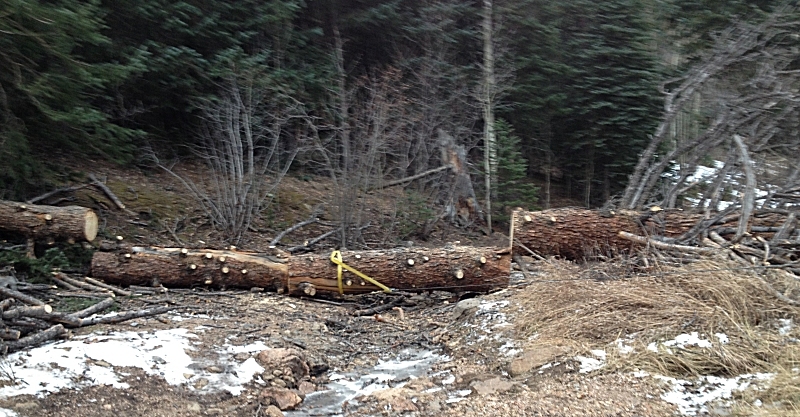 It's awaiting someone else to clear (hand saw - I was tired).